to discover brokerages which will deal fairly with U.S. persons ! price improvement, so that’s another FAIL. This thread’s efforts MUST CONTINUE !! I recall last summer asking about it with LMAX tech support chat, and they said no as well. It is unfortunate as LMAX has some good trading instruments. No hedging tho. "take" your Bid or Offer and thus give you a “better than retail” price. Other than that, LMAX has no particularly distinguishing features. a discussion for this forum thread. Thanks for the vid HS - really helpful. We (including me) need to start documenting more of that kind of primary source. Thanks for the vid HS - really helpful. And the Ouagadougou time-zone is my favorite. I always keep my watch set to Ouagadougou time. On another THREAD, Clemmo addressed a question to the [B]FX Choice[/B] representative regarding the removal of certain trading instruments from the broker’s menu of instruments. An FX Choice rep referred to the “Company News” section of their website for details. Here is the FX CHOICE ANNOUNCEMENT, dated 11/11/2016. I think they communicated it on time and a fair way. I like if a broker tells the real reason. After all they live from profits as well and if nobody traded those instruments then no reason to keep them available. I guess many would have not even said a reason, just to “close your positions”. Still, if someone traded those pairs, this might be of little help to know why he cannot trade his pairs anyomre. OK, I recorded the CPI News Event this morning using USD/JPY with FinProTrading.com Live versus TradersWay.com Live and here is the link to the video. The event comes at 12.30 GMT (“Ouagadougou” time). For those who are unfamiliar with the MT4 Tick chart, it may be difficult to visualize, because FinProTrading on the left emits many more “ticks” or Price updates than TradersWay. Due to the “auto-scaling” of the Tick window, it may be confusing visually to understand the comparison left vs right. A couple of times, I draw circles showing corresponding price points left versus right. The video is SILENT and the “action” occurs at 12.30 on the GMT clock display. You can clearly see that FinProTrading has a “higher resolution” tick feed, and you can also see that its Bid/Ask spread is more “reactive” than TradersWay. Both are reliable brokerages, and pricing is “the same” but visually the auto-scaling may make it seem otherwise. This does confirm the “freeze” which was observed. Looking closely you can see that TradersWay does “freeze” during the period just after the 3.00 time marker, after the initial down move. BUT, overall the pricing is the same and I don’t see any significant issues with the overall Pricing on one platform versus the other. Of course this does not measure Order Entry performance, and I know from experience that FinProTrading is faster but the differences for non-scalpers are not significant. Hope this helps to show differences between a couple of our brokerages. Again, TradersWay is a very good brokerage and side-by-side comparisons like this may suggest otherwise. Don’t be fooled by mere appearances, but you can clearly see FinProTrading generates a higher resolution price feed. Thanks a lot for sharing, really nice video. Why is LMFX no longer checked as a trusted Broker? LMFX has never been designated as a Trusted Broker. Shortly after joining the Babypips forum (and this thread), [I]LMFX requested[/I] the Trusted Broker designation. See THIS POST and THIS POST for the back-story. Several times since then, I have asked (in this thread) whether there is interest in adding the Trusted Broker designation to LMFX – or to any other broker on our List. My most recent request was THIS POST. But, not much interest has been expressed. At any time, if the participants in this thread want it, another broker (or more than one) can be awarded the Trusted Broker designation. That decision, like past decisions, basically will be a democratic vote taken here in this thread. See THIS POST for some background on the process. The suggestion to designate LMFX as a Trusted Broker is still on the table. CFTC is taking interest in crypto-currency. China has already been at work on Ethereum. I am glad my country takes interest. Let’s hope the CFTC adds value instead of locking out anyone that isn’t a billionaire like they did to international Forex. My hopes are high and unfortunately confidence is low. My hopes are high and unfortunately confidence is low. Cryptocurrencies, and bitcoin in particular, are starting to look like viable alternatives to the conventional money-transfer methods (bank wire, credit card, PayPal, etc.) that we have relied on for moving funds to and from our offshore brokers. The CFTC and other fascist regulators have attacked those conventional money-transfer methods, as a way of attacking the offshore brokers they serve. My suspicion now is that the CFTC’s interest in “blockchain” technology is not at all about the purposes mentioned in the article. Instead, I suspect that the CFTC’s interest in “blockchain” is all about finding ways to [I]get control of cryptocurrency money-transfers,[/I] so that they can continue to strangle the offshore brokers who, so far, have escaped the iron fist of the CFTC. In this circumstance, my hopes – as well as my confidence – are low. But it will be helpful if an older member takes a stab at educating users of this thread on how to use bitcoins and relevant providers, brokers & BTC exchanges. BitCoin is one of the best source of money transfer available today and its mature enough of a technology to rely upon. It not only lets you fund your forex accounts, but also lets you plan your taxes efficiently (since bitcoins are either digital assets or a commodity and you can not be taxed unless its converted to fiat currency). I think its totally worth it to get used to it. Clint, I share your healthy scepticism about the interest in BTC (BitCoin). Of course, we know the U.S. IRS classifies it as “property”, rather than "currency"
but we use it as currency. Property transactions are subject to capital gains, of course. account with 500:1 leverage (they fund with BTC only, I think). right now with the BTC frenzy rally against the USD 1 BTC is worth roughly $2200. So that 50,000 BIT is about $110.00 at current peak exchange rates. in using this crypto currency; but that can also be an opportunity ? Before you attempt to post this information for the second time, save a copy, in case things go awry again. If that happens, send the entire post to me via Private Message, and I will post it in your name. You are giving me more credit for bitcoin knowledge than I deserve. I am not a bitcoin expert. I categorically deny that I am Satoshi Nakamoto. As we become more familiar with bitcoin – and as the price of BTC/USD (one bitcoin priced in dollars) goes ever higher – we’ll get more comfortable with the fractional divisions of bitcoin. In theory, those fractional divisions of bitcoin are no more complicated than the fractional divisions of the dollar: quarters, dimes, nickels and pennies. But, the numbers themselves are a bit daunting. The answer lies in the [I][B]bitcoin protocol[/B][/I] – the original scheme devised for bitcoin by “Satoshi Nakamoto” (whoever he/they might be). The scheme is such that the financial incentive to “mine” bitcoin will diminish over time, until that incentive will effectively disappear when there are 21 million bitcoin in existence. If the protocol plays out as designed, 21 million will be the final worldwide stock of bitcoin. If we envision a bitcoin system in which there are enough bitcoin in existence to substitute for, say, 5% of the world’s money supply, then the world would need $4 trillion worth of bitcoin, given today’s market metrics. If the total stock of bitcoin is capped (by the bitcoin protocol) at 21 million bitcoin, then the price of BTC/USD will have to soar to $190,000 per bitcoin. — then 1 mBTC = $190, 1 bit (1 µBTC) = $0.19, and 1 satoshi = $0.0019 (19/100 of 1¢). This thought-experiment does not account for the time factor. We are “equating” the ultimate stock of bitcoin [I]at some time in the future[/I] to an assumed percentage (5%) of [I]today’s[/I] worldwide stock of conventional currencies. But, the ultimate stock of bitcoin (21 million BTC in existence) is not projected (by the bitcoin protocol) to be reached before [I]the year 2140. [/I] A lot can happen in the next 123 years. Suppose bitcoin gains traction; suppose its increasing use requires increased “mining”; suppose interest and confidence in bitcoin drives its price higher until the [B]bit[/B] achieves “parity” with the U.S. dollar; and suppose that all of this happens long before the year 2140. In other words, in this [I]very[/I] hypothetical scenario, the ultimate worldwide stock of bitcoin would reach 21 million well ahead of schedule, and [B]1 bit would equal $1. [/B] Furthermore, the total value of bitcoin in existence would be slightly greater than 26% of the world’s money in circulation (based on the January 2016 money figures used in the example above), not 5% as supposed in that example. Maybe those are the prices Satoshi Nakamoto had in mind from the beginning. The ISO 4217 currency code for Bitcoin is XBT. However, at the moment it is an unofficial code according to the ISO 4217 standard. The unit name BTC is also commonly used to represent one bitcoin, but it violates ISO 4217 because it begins with “BT”, the country code of Bhutan. Bhutan does not actually use the code BTC for any currency, and XBT has not yet defined which unit it represents (just that it represents some unit of bitcoin), so the Bitcoin community is likely to continue using mainly BTC as a unit name and currency code for some time. A formal application by the Financial Standards Working Group of the Bitcoin Foundation is nearing completion [still true?]. This application would request ISO 4217 standard to support XBT. The broker system for loading charts and execution is extremely fast, even faster than FXChoice in my opinion, thats 1 of 2 reason i like them, the second reason is their 1:500 leverage. But for leverage 1:500, i found out that when your equity goes above $5k, your leverage became 1:200, and if you trade and somehow your equity goes below $5k, you can’t have 1:500 leverage back, not for 30 days since your last leverage changed. 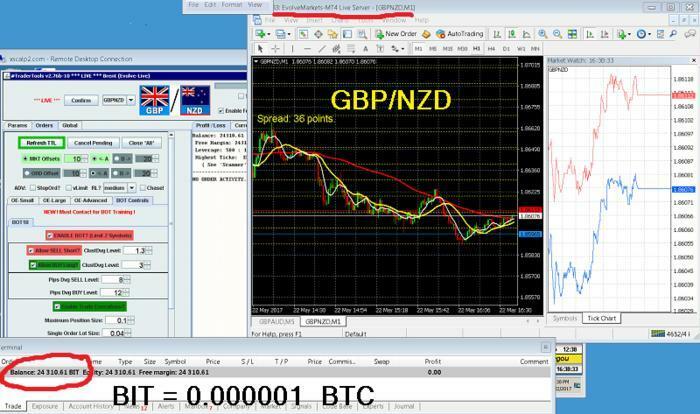 Their spread is very low, for major currencies, the spread is below 1 pips, well i am comparing them with FXChoice, and FXChoice pro account for AUDUSD and NZDUSD is around 1-2 pips, rarely goes below 1 pips. And their swap is a little bit higher than FXChoice but not as high as Trader’s way. Commission is lower than FXChoice. The broker sites is ****ty as well as their support, they don’t have live support, and when you login to your account, it’s very unprofessional, unlike all other broker. Well thats all folks, if you looking for broker with fast execution and lower spread, commission, higher leverage, i would recommend them, but don’t expect anything from their support and their sites. as for trustworthy or not, i can’t say anything on that matters, although they say that they are regulated, but i highly doubt that they are. The broker system for loading charts and execution is extremely fast, even faster than FXChoice in my opinion, thats 1 of 2 reason i like them, the second reason is their 1:500 leverage. I will include your comments in the LINKS in post #7, on the next update of the List. I don’t know whether this is good news for us, or not. This proposed new bank appears to offer [I]hope for some relief[/I] from current money-transfer problems to and from offshore companies – specifically Caribbean offshore companies – and that [I]may[/I] open up new money-transfer possibilities for the offshore forex brokers we deal with. If this new bank gets up and running as planned, it will be open for business in the fall. We should keep an eye on this development, even as we continue to pursue other money-transfer solutions using bitcoin. The global campaign against money laundering combined with the Panama Papers made the Caribbean islands of sun, sand and offshore banking a near no-go zone for the world’s biggest banks. So the British Virgin Islands has a solution: a bank to service offshore companies, many of them from China, locked out of the global banking system by HSBC Holdings Plc, Standard Chartered Plc and others. The new Bank of Asia (BVI) Ltd. is to begin operating online later this year. “We have a captive client market of all these offshore companies that have had difficulties opening bank accounts, not for their own fault but because the legacy banks have stopped wanting them,” said Carson Wen, 64, a former acquisitions lawyer at Jones Day in Hong Kong and now founder and chairman of the bank. He plans to target the 200,000 out of 400,000-plus BVI companies that can’t get bank accounts. In a speech in January, [BVI Prime Minister] Smith expressed hope that Bank of Asia “will mitigate against the restrictive banking practices that have impacted our incorporation numbers,” citing the effect of the Panama Papers’ revelations. Elise Donovan, director of the government’s BVI House Asia in Hong Kong, said in an emailed statement that the bank’s license was approved and that BVI officials were delighted. I saw this article in the print version of BloombergBusinessWeek (the May 22 - May 28 issue). Bloomberg is very restrictive regarding the sharing of their copyrighted material on the internet: only certain articles appear in bloombergbusinessweek.com. Links to Bloomberg articles posted in other sources usually fail, generating a 404 error message. However, some sources apparently have permission from Bloomberg to redistribute certain material, and that’s how I came upon this reprint in msn.com. The title of the article is different, but the content is the same. For the members of this thread, who have interest in bitcoins, I will share my research again by the end of this week.